Fitting Hiclones can be a simple operation of just opening an air filter box or undoing a hose clamp. No cutting of hoses is required. 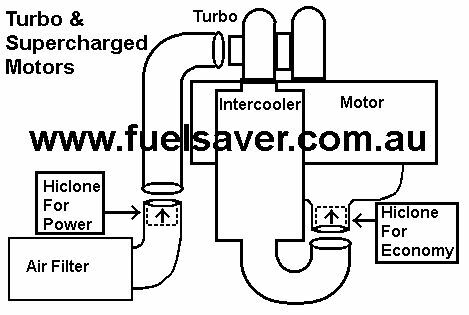 Individual vehicle fitting drawings are provided with all Hiclones ordered direct from our Melbourne office, for self installation. But some cars can be more difficult to install. We have shops in many parts of Australia, who can both supply and install the Hiclone product for you. The fitted price can vary between stores. 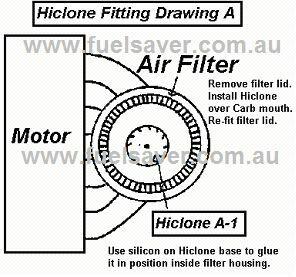 Fitting Instructions: For most Carburetor engines, where the air filter is on top of the Carburetor, the Hiclone is fitted in the air filter box over the mouth of the Carburetor. 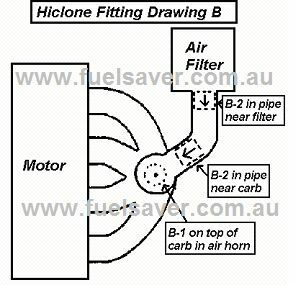 For engines with a separate or remote air filter, Hiclone is fitted either over the Carburetor mouth in snorkel or in the hose between the filter and the Carburetor. Cars with twin or multiple inlets can need more than one part. The best method is to remove the assembly intact, turn it upside down to get an approx. measurement at the indicated position. Common sizes for 4 barrel Carburetors: Most of these are around 165mm in diameter. Hiclone Part numbers & Heights in MM - Ford-58A 25mm Ht; Benz-5 34mm Ht; Ford-58B 39mm Ht or Hold-56 45mm Ht. Fitting positions vary greatly for these engines, but the general rules are the same as other Hiclone installations, we use the largest size locations in the air intake. For low torque, small petrol engines, the first Hiclone is fitted close to the inlet manifold (motor), and an optional second part can sometimes be fitted near the air filter. For high torque petrol engines, the first Hiclone is fitted close to the air filter, and an optional second part can sometimes be fitted near the inlet manifold (motor). 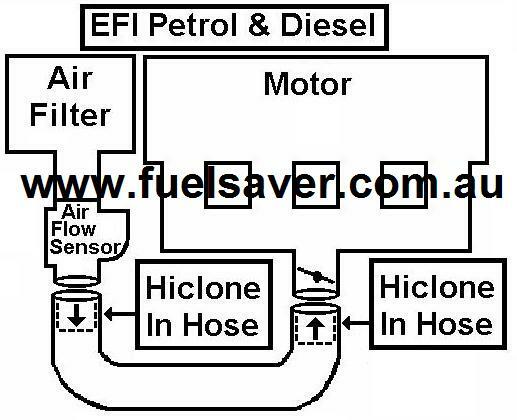 For Diesel engines, the first Hiclone is fitted close to the inlet manifold (motor), and an optional second part can be fitted near the air filter. Cars with twin or multiple inlets can need more than one part. For unusual cars you can measure the inside diameter in mm in these positions, but most cars sold in Australia have already been measured and tested. For Turbo vehicles we suggest installing Hiclones in two positions. The first Hiclone fitting position is near the intake manifold, after the Turbo or intercooler, to improve combustion and economy, this also improves engine torque. We use the largest size, and closest to the inlet manifold. Cars like the Toyota V8 CRD have two inlet manifolds, requiring two parts in this fitting position. For unusual cars you can measure the inside diameter in mm in this position, but most cars sold in Australia have already been measured and tested. The second Hiclone fitting position for Turbo engines is near the air filter, before the Turbo. This part helps the Turbo Impellor to spin, reducing Turbo lag, bringing the boost in around 400-500rpm earlier. This is what we call the power position; its main effect is improving engine torque. We use the largest size, and closest to the filter box. For unusual cars or for aftermarket conversions, you can measure the inside diameter in mm in these positions, but most cars sold in Australia have already been measured and tested. If you are unsure, you can send a digital picture of the motor. We may already have it on our files, or we can mark on the picture where we need measurements. LPG & CNG conversions and factory systems can also be installed with Hiclones. In most cases the same parts are fitted as in the standard Petrol or Diesel versions, but some systems require special parts. If you are unsure, you can send a digital picture of the motor. We may already have it on our files, or we can mark on the picture where we need measurements. Every Hiclone ordered direct from us will come with vehicle specific fitting instructions. The utmost important part of installing a Hiclone is not just having the right size...but also placing it in the right position in your vehicle. 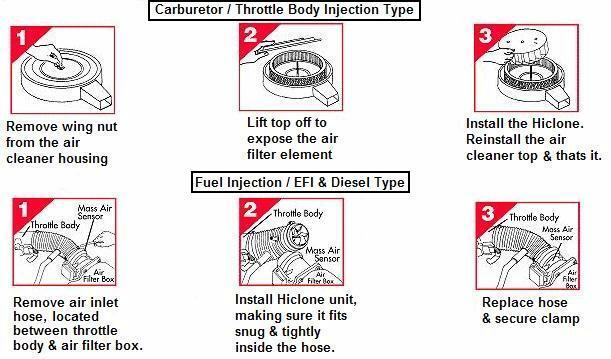 Warning: These diagrams are only to illustrate the basics of installing Hiclones. Vehicle specific instructions will be supplied when mail orders are required. CAUTION: Work gloves must be worn when handling and installing the unit. NOTE: The front edge of the Hiclone fins are curved, the rear is flat. The curved edge faces the incoming air flow. Hiclone should fit snug and tight inside of hose. Hiclone has No moving parts and will therefore out last the life expectancy of any engine. Hiclone requires NO engine modifications and NO chemicals. It is for these reasons that we offer a lifetime warranty and an unconditional Money-back guarantee. Hiclone helps improved economy, increased power, reduced engine emissions & noise, and it is easy to install. Buy Hiclone(s) for my car.